A feral cat is one that has had little or no human contact and is usually unapproachable by people. 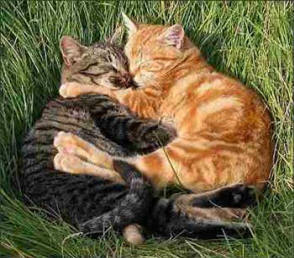 These cats do not make loving companions, but they still deserve the care and respect of humans. They have adapted to outdoor life without human contact, living together in loose families organized as colonies, and can do well in urban as well as rural areas. If you notice feral cats in your area and have decided to open your heart to help, there are several things you can do. It should be understood that adult cats will likely never make good housecats and should not be considered pets. The remainder of their lives will be spent in their colony. Even though these cats won’t show affection like your housecats, they can show their gratitude and appreciation by slowly accepting your presence in their environment. Caring for feral cats is quite controversial. Some people feel that all stray cats should be euthanized. Still others feel they should be left to their own devices and not helped by humans. And then there are the groups of people who choose to help these cats and who understand that these cats have a right to life just like any other cat, although they need some human intervention to maintain health as well as deter overpopulation. The first part of caring for a colony of cats is to provide food. Start by feeding the cats once a day. Dry food tends to work best. These cats are skittish and nervous so place bowls and dishes under bushes, shrubs or near walls to allow them to eat in privacy. Make sure to provide fresh water, too. If you begin feeding every day at the same time, the cats will become used to the routine. Keeping a routine will aid you when it is time for the ultimate goal: trapping them to neuter or spay them, then returning them to their home. If you are managing and caring for a colony of feral cats, consider obtaining a live trap. Many humane organizations or local shelters provide live traps for capturing stray animals. Set the trap according to instructions and place some food within the trap. When the cat enters the trap, the latch is sprung and the cat is safely trapped. After trapping, you can transport the cat to a veterinary clinic to be spayed or neutered. This is the single most important thing you can do to maintain the health of the colony and reduce overpopulation. Some veterinary clinics offer reduced fees for people assisting feral colonies. Make sure you have a veterinarian who is willing to assist you before trapping the cats. After the surgery, the cat should be returned to the colony. Make sure that if any sutures are placed, they do not require removal. More than likely, you will not be successful in trapping that particular cat in the future. Try to limit the number of feeding areas, and feed only in the daytime. This makes monitoring the colony much easier. You can look at each cat and observe whether he is healthy. Also, by not feeding at night, competition with other wild animals, like raccoons, skunks and opossums, is not much of an issue. Make sure the feeding area is clean. Remove any cans or old uneaten food. During your daily feedings, check for any newcomers. Make plans to trap and spay/neuter these cats as soon as possible. You may be able to socialize and even find homes for some of the feral cats. You will have the best chance of doing this with feral kittens than with adults. If younger than 12 weeks of age, feral kittens have a pretty good chance of being socialized and becoming house pets, but they may take up to a couple of months to socialize. If the cat is older than 12 weeks of age, he may never be socialized. Kittens cannot be socialized if left in the colony. The first thing to do is to bring the kitten indoors and confine him to allow frequent access and human interaction. Initial confinement in a dog crate or carrier works well. If you have more than one kitten, keep them isolated from each other. Provide a small litter box, food and water. The key to taming a feral cat lies in food. Baby food and canned cat food work well to coax the kitten and get him slowly used to your presence. Feed this special food twice a day but leave dry food out at all times. Slowly begin touching, petting and holding the kitten for a few minutes a day. Gradually increase the amount of time spent handling the kitten. Within a few days or up to a few months, the kitten may eventually become comfortable around you and eventually be tamed enough to become a pet. If you do not have the time or inclination to socialize kittens, feeding, trapping, neutering and returning the cats to their colony will also be a tremendous help to the feral cats in your area.